In July 2017, SPRING/Guinea held a six-day training on a graphic design technique known as the Photo-to-Illustration (PTI) process with illustrators and IT managers in Guinea and Sierra Leone, as well as Peace Corps Guinea staff and volunteers. 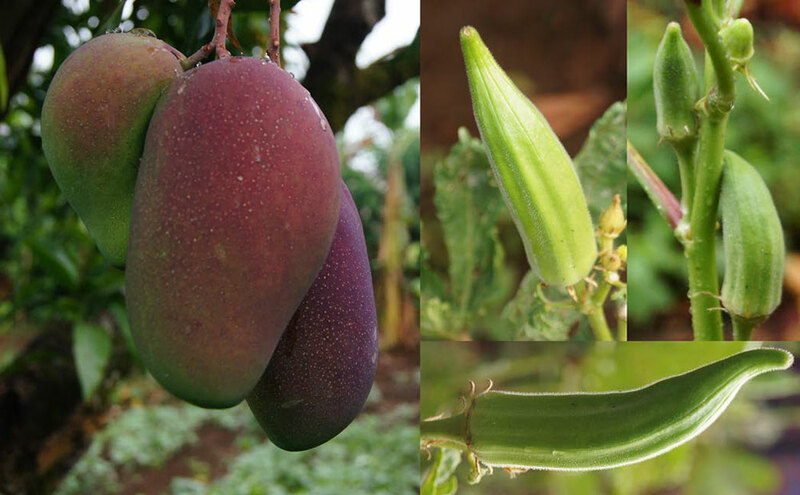 The PTI process involves taking a reference photograph, tracing a line drawing, and using graphic design software to add color, shading, and patterns for a realistic image that is used in social and behavior change communication visuals for nutrition, health, and agriculture. The following images show participants’ first experiences in the PTI process and help to demonstrate how the process can be used to make a variety of high-quality images for SBC materials. 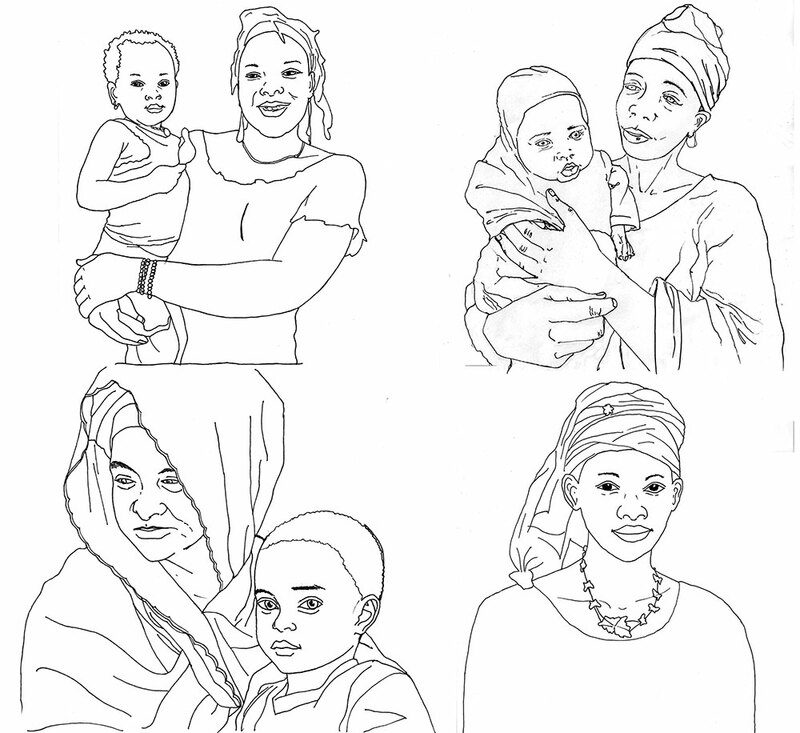 If you would like to use illustrations for your own program, please see the Infant and Young Child Feeding Image Bank. 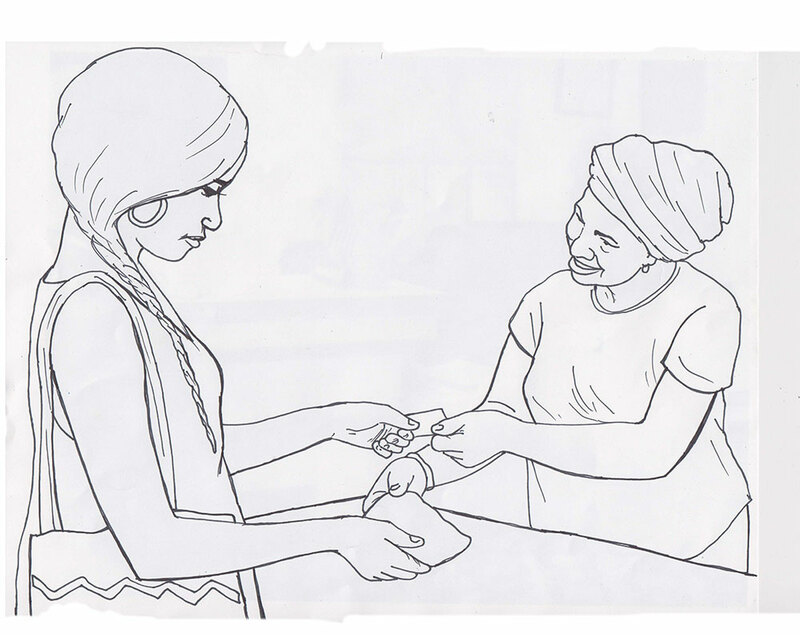 This website, a collaboration between SPRING and UNICEF, hosts hundreds of illustrations produced through the PTI process. 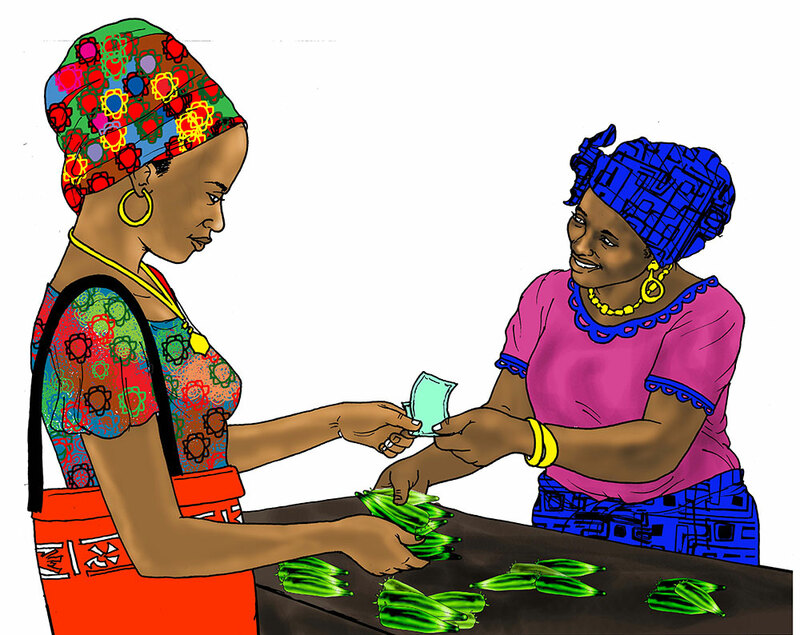 The illustrations are provided as layered image files that can be easily adapted to your context using graphic design software. 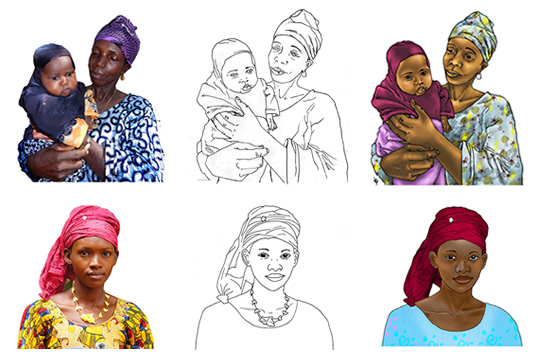 During the Photo-to-Illustration (PTI) Workshop in Guinea, SPRING trained participants in the PTI process, a specific technique for creating high-quality illustrations through a process involving tracing a reference photograph and then scanning and importing the resulting line drawing into the computer to add color, shading, and patterns. The PTI process begins with a reference photo, which provides an easy way to capture correct proportions of your subjects, as well as important cultural details. 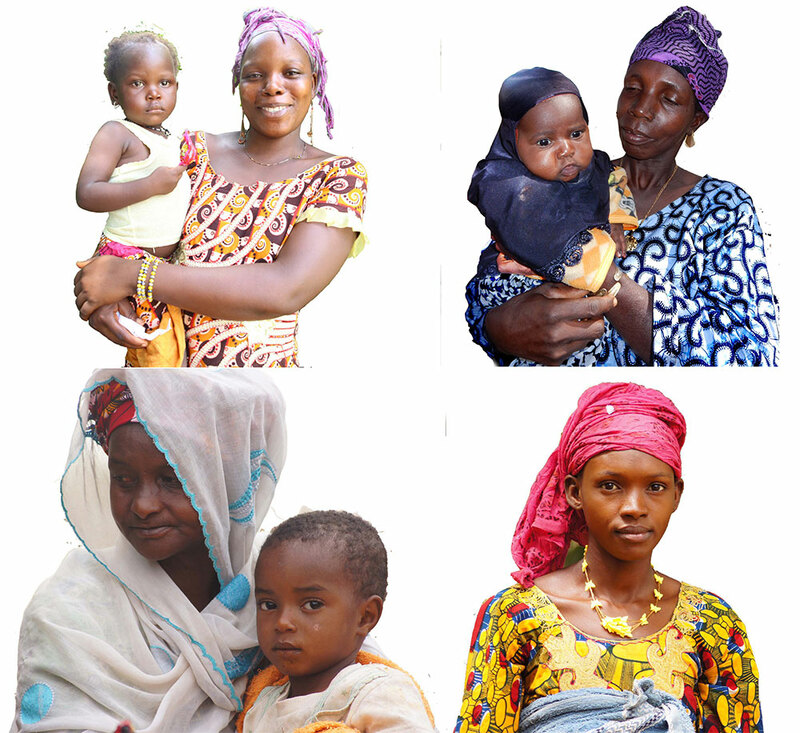 Our participants practiced with several examples of Guinean women, mothers, and children. Using Adobe Photoshop, participants removed the background of the photo and adjusted the brightness, contrast, and colors of the image so that the outline of the figures would be easy to trace. Participants completed the tracings on the back of the printed images, using a light table. They also practiced tracing by taping their printed photo up to a brightly-lit window. These tracings were then scanned and uploaded to Photoshop. In Adobe Photoshop, the participants cleaned up the tracing and added color, shading, and patterns to the image. 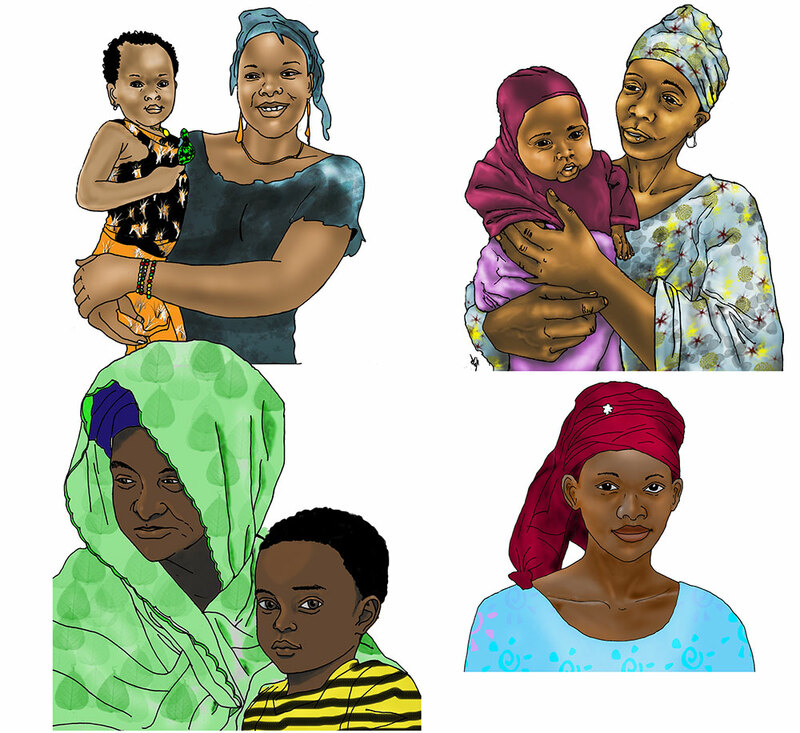 These illustrations were all completed by the first few days of the workshop. Showing the stages together in one image. After several days of practice, participants had built up their skills and were prepared to work on images relevant to their partners’ programs. The workshop gave participants an opportunity to practice taking reference photography. 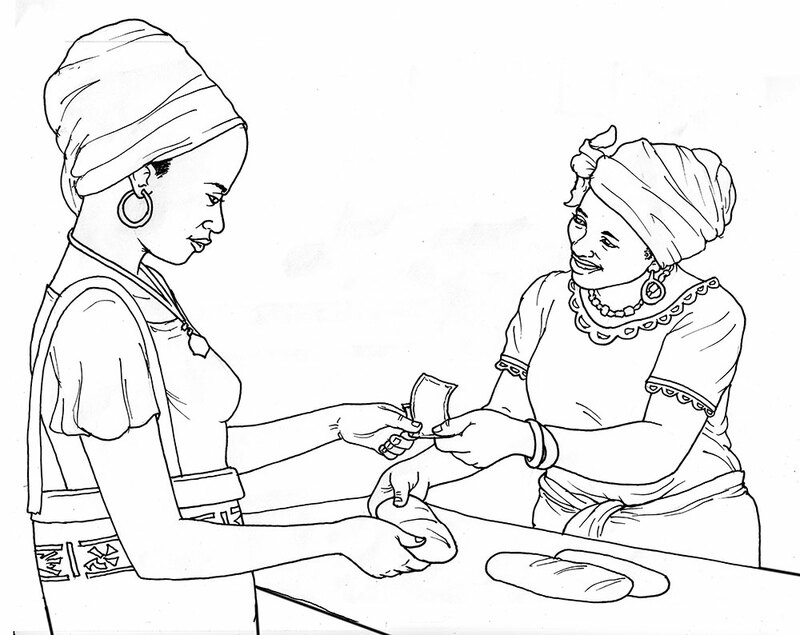 Here, Peggy Koniz-Booher and Aissatou Kade Balde (Kade), a member of La Bulle d’Encre, pose for a photo of a vendor selling products to a consumer. Here is the resulting tracing that was made from the previous photo. After tracing, the photo was cleaned up in Adobe Photoshop. Note here that La Bulle d’Encre made some changes to the hairstyles and dress of both subjects in the photo, in order to make the illustration more appropriate for the context in which it may be used. This is the final image, with color, shading, and patterns completed. …and okra. By using the PTI process, there is no need to recreate the image. Different objects in the illustration can be lifted out and replaced easily. 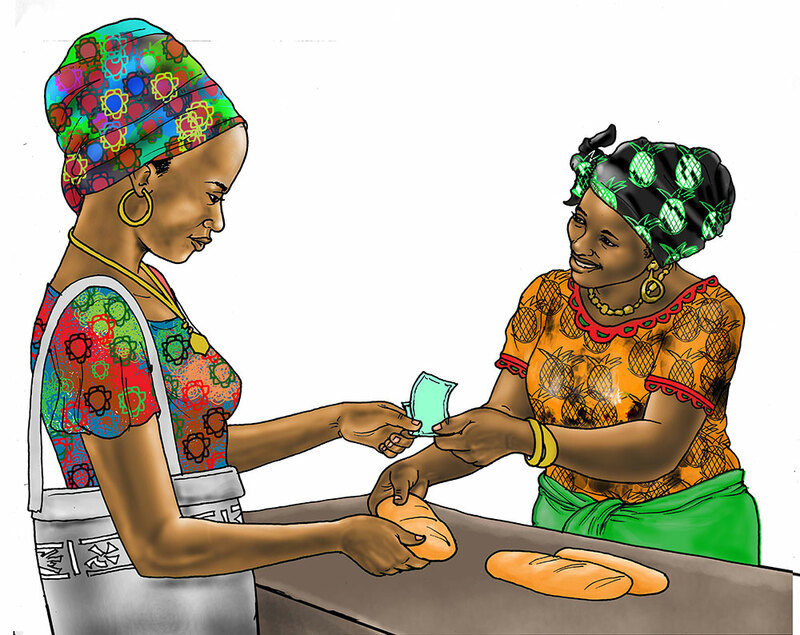 Even patterns and colors can be removed and exchanged quickly, as was the case with the vendor’s clothing style in these two images. 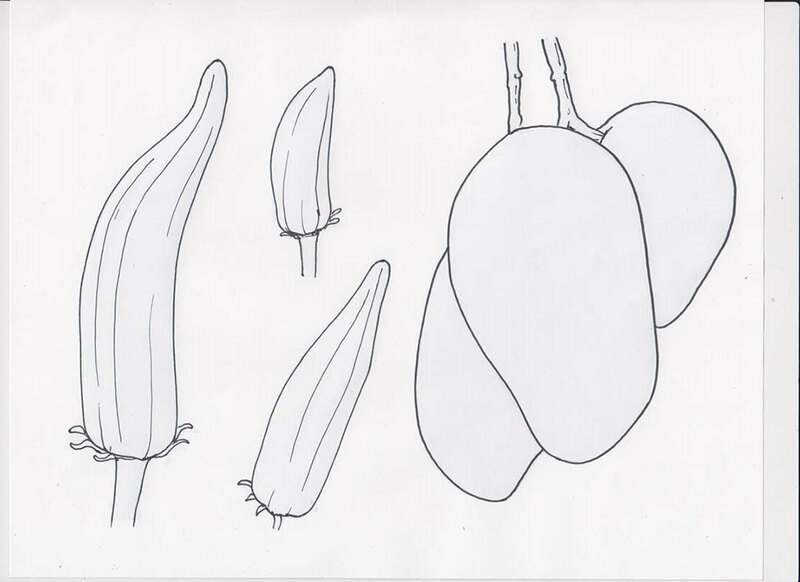 In order to make these new images, only a few additional reference photos and tracings were needed. 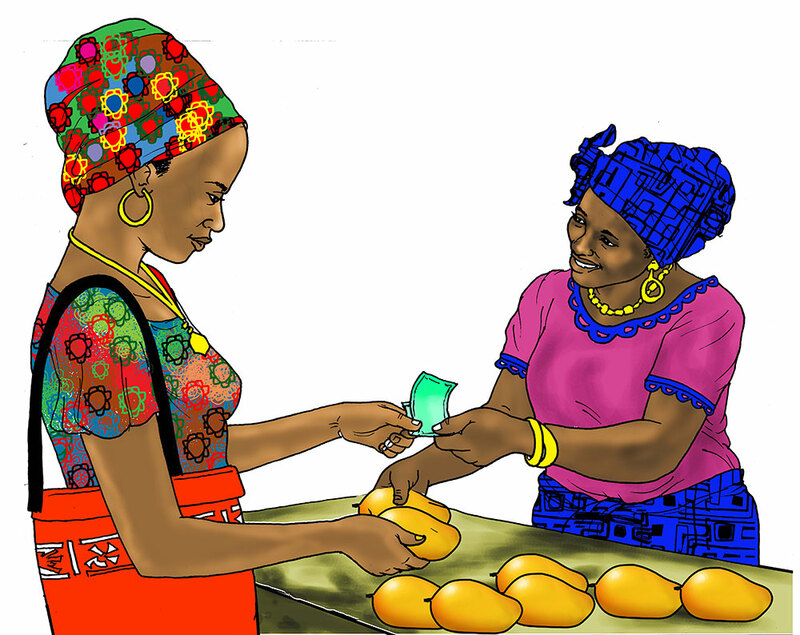 These tracings were quickly colored and copied into the image of the vendor and the buyer, without the need to redo the entire image.